He doesn't waver! Isn't that comforting? God is consistent and in his consistency, he gives good gifts. He created the world in all its majesty and gave it to us to use. When sin strangled life, God gave us the promise and executed it through Abraham and the Israelites. When death claimed us, he gave us Jesus, crucified and resurrected, to give us the assurance of our victory over sin and death. 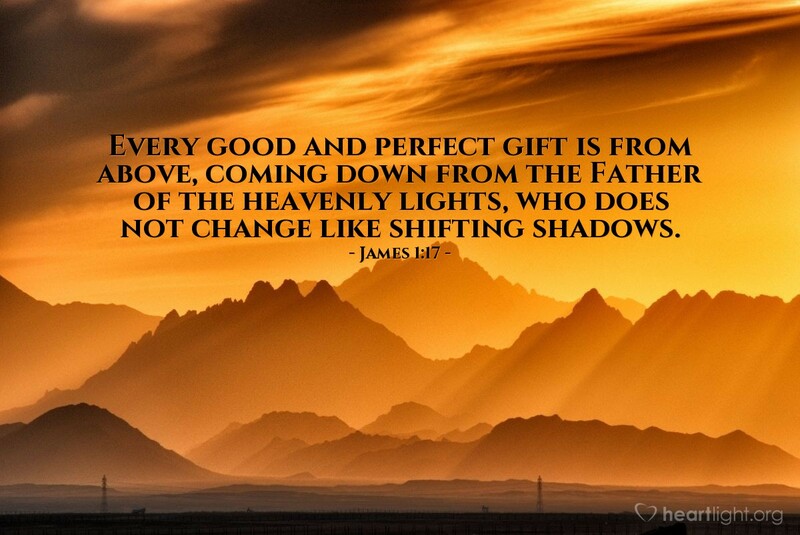 There is no shadow in that brilliant light and we are assured that light will keep on shining! Gracious and generous God Almighty, thank you for consistently giving me your grace, your gifts, your love, and your promises. I have no one; I have nothing, that compares to you. Thank you for all your many gifts in Jesus name! Amen.